The Boston Celtics Outlasted the Philadelphia 76ers in their NBA season Opener! At last, the NBA is back and a new season begins today! And now I'll give you some recap of the Boston Celtics VS Philadelphia 76ers match. Here we go! It's a very entertaining match as the Boston Celtics and the Philadelphia 76ers battles it out at The Garden and the Boston Celtics defeated the Sixers, 105-87. It was a convincing win for the Celtics as they beat their playoffs rival last season with style. Both teams didn't play very well in their opening night but the Celtics managed to take advantage of Sixers' turnovers. It was a close game in the first half but Philly committed 11 turn overs in the first half which hurts them big time as the Celtics walk away and started to build their lead. Jayson Tatum was the star of the night as he posted 23 points, 9 rebounds, 3 assists and 1 steal shooting 9 for 17 from the field. Tatum looks pretty good and looks like his training with Kobe Bryant turned out well. I saw some Mamba moves from him in this game and I think he will be more dangerous if he is the first option of the team in scoring. Boston is overloaded with wings and they must do something about this to give Jaylen Brown and Jayson Tatum enough time to develop their game even more. I love Tatum's attitude and competitiveness. Did you see how he stares down at Joel Embiid after a sweet bucket? Maybe the Mamba also taught him how to have a killer instinct and the Mamba Mentality. Meanwhile, Kyrie Irving and Gordon Hayward had a warm welcome from the fans for their comeback as they are given an ovation before the game starts.But the two all-stars did not have a good shooting night. The two combined a 6 for 26 shooting from the field in the game. Hayward had a rough start missing his four first attempts but then made two sweet jumpers after that. He finished with only 10 points, 5 rebounds, and 4 steals. Irving made only 2 of his 14 attempts in the game and finished with only 7 points, 4 rebounds and 7 assists. Al Horford did a great job defensively as he recorded 9 points, 4 rebounds, 2 assists and 5 big blocks. Most of them are against Joel Embiid. Terry Rozier was fine finishing with 11 points, 8 rebounds and 1 assists on 50 percent shooting while Jaylen Brown had 12 points, 5 rebounds, and 2 assists including a monster dunk in the face of Joel Embiid. Marcus Morris was a big factor off the bench finishing with 16 points, 10 rebounds and 2 steals. 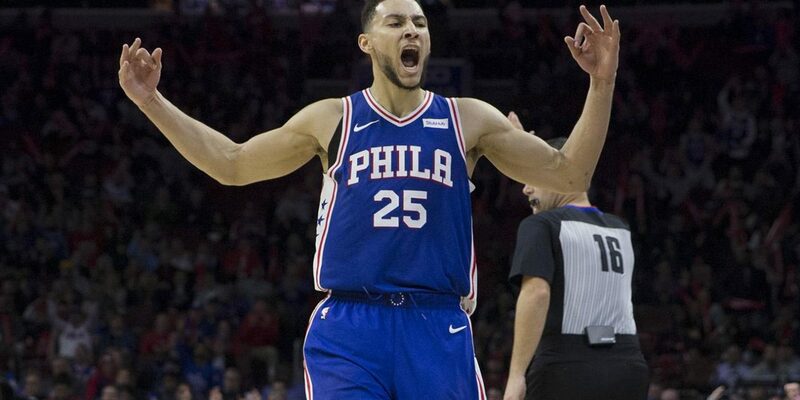 Ben Simmons was outstanding in his opening night finishing the game 2 assists shy of a triple-double. He totaled 19 points, 15 rebounds, 8 assists, 4 steals and 2 blocked shot. Simmons is everywhere and he does it all on the floor offensively and defensively. I don't know how he does those fancy passes and he's very efficient on the floor. I truly see him as the next LeBron James. He's a monster. It was very entertaining to watch Ben. Joel Embiid was also a monster. He scored 23 points grabbing 10 rebounds with 2 assists, 1 steal and 2 blocks. He's very good in the post and he always dominates there but sometimes he just forces his shots and not thinking well underneath the basket. I believe he will improve that. Look at him, 4 of his shots were block under the basket and that was all forced shots. JJ Redick scores 16 points but shot only 7 for 17 from the field. He took 17 shots including 8 threes but finished with a not so good percentage. I think he needs to pass the ball more. Simmons, Embiid and Redick are the only players for the Sixers to score in double figures. I think that's the reason why they lost this game. They need more help from their bench. Boston's bench destroys Philly's and that is not a good sign. Still, its a very long season and both teams will surely get better. I've waited very long for the season to start and I'm happy that I will be able to watch a game everyday. This will be a very entertaining season. That's all for today folks! Have a great day!